I’ve had a rather heavy training year thus far, and came to the conclusion that perhaps I had piled on a few more miles than were necessary after Flatrock. So, I entered this weekend’s Booneville Backroads 100K with a comfortable taper-filled week and plenty of energy as I sought to rid myself of the 100K demon 🙂 I’ve tackled the 100 mile/ 24-hour distance, and I’ve tackled the 50 mile distance on numerous occasions, but the 100K distance had thus far eluded me. 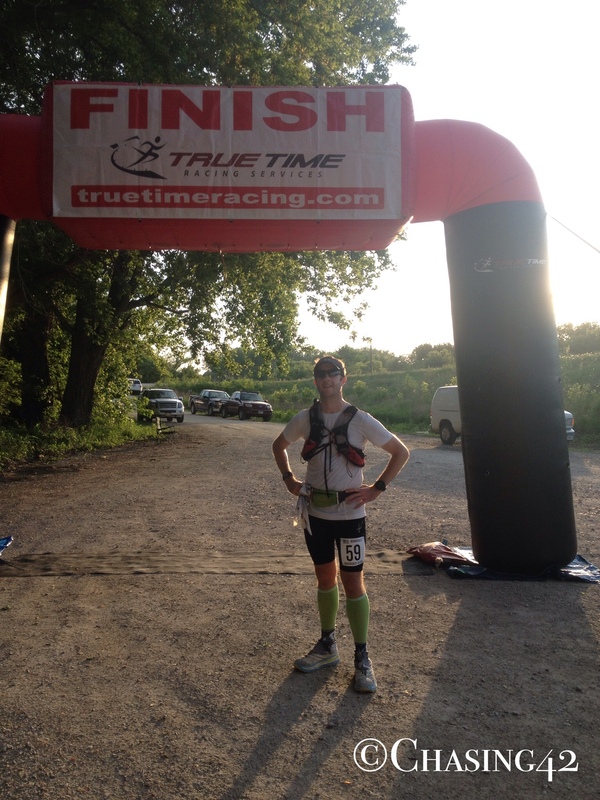 It was only appropriate then, that my first 100K finish was at the first and only 100K race in the state of Iowa. 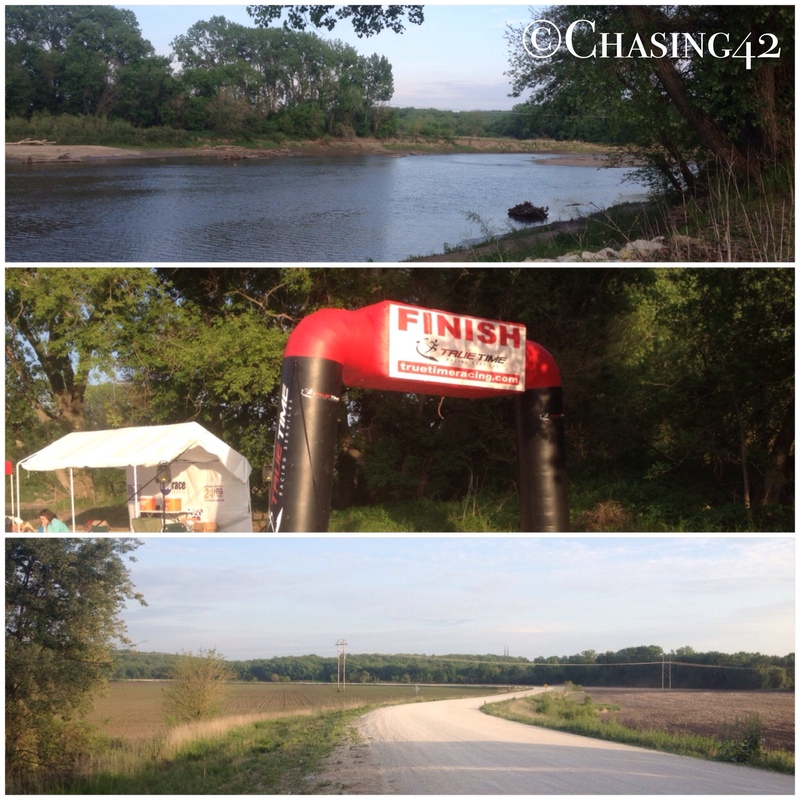 The Backroads 100K was offered for the first time this year (along with a 50k and 50k relay), and it offered a “scenic” tour of the country gravel roads of southern Iowa, including a tour of the bridges of Madison County. It was a hot, hilly, and challenging experience, and one I will certainly remember for some time to come! 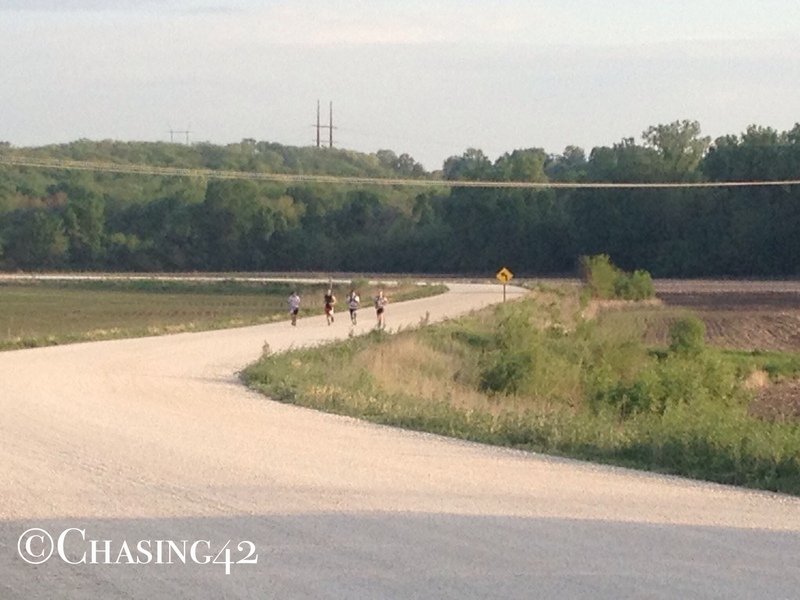 Plenty of gravel and open fields lined the route! The epicurean and I headed down to Des Moines on Thursday to pick up my race packet, as well as drop off my drop bag for the race, which would be placed at the 50K mark. We headed back down to Des Moines the following night for a brief stay in a hotel, which we agreed would make the early wake-up time on Saturday morning much more bearable. We got to the hotel around 10pm after putting the dogs to bed, and I set out my gear for the following morning so I’d be able to put as little mental energy as possible into getting ready. This is important when you aren’t exactly a morning person and the alarm is going off at 4:30AM. I got about 5 hours of sleep and woke up slowly to get ready and load up into the car. The aid station placement seemed a bit spread out, so I decided to wear my Salomon pack, as well as carry two 17 oz. Salmon soft flasks up front. I opted for my Hoka Stinson Evos to give my feet some comfort over the longer distance, which seemed to make sense since we would be mainly on gravel roads but the terrain wasn’t terribly technical. I ordered a pair of dirty girl gaiters (review coming soon) the week before, and utilized them as well. These three gear choices proved to be crucial throughout the day! I did my best to go out relatively slowly so that I wouldn’t burn out too early. This seems to be a constant concern for me, no matter how much I focus on it, but I probably did better this time around than in many previous races. The aid stations were 10-12 miles apart (with coolers set up in between), which was indeed a bit far, so my bladder and extra bottles proved to be invaluable. It was relatively cool at the start, with a few clouds overhead, and the first 10 miles went by pretty easily. Aside from a few folks that started out pretty fast, most of us were clumped together and able to chat along the route as we made our way down the endless country roads. I seemed to have always been with someone or within sight of someone else, which was quite welcome, especially considering the small field. The first aid station approached, but we weren’t greeted with much (water, Gatorade, GU), so I was happy that I had made sure to pack my own nutrition as well. The sun asserted itself as the morning wore on, and by the time we approached the 50K mark, Mother Nature was doing a fine job of heating us up. We got our first taste of the “B roads” before pulling into the aid station, and were amused by the car that had clearly made a poor judgement call when attempting to drive through some rather deep mud and water. I arrived at the 50K aid station with a few other runners who I’d ended up falling in pace with earlier on and it was great to have folks to chat with and help pass the time, as well as confirm my directional choices! I refilled my hydration bladder, topped off my bottles, and took in some additional nutrition before heading out again. We had hit the 50K mark in 5:15, which was a bit faster than I probably should have been going, but I was still feeling pretty good and in high spirits. I headed out with another runner who happened to also be a grad student at ISU, so we found plenty of topics to help pass the time. We picked up another guy not too long afterwards, and the three of us would ultimately finish the race together, along with a 4th runner. Around mile 35, my left IT band began to sting quite a bit more than normal. It was a rather sudden and sharp pain, which was something I hadn’t felt before. I pulled back and walked a bit so I could massage it, and the pain subsided somewhat, but still managed to follow me for the remainder of the race. I’ve always felt that ultras are more mental than physical at certain points, and this certainly became the case as we pushed on. 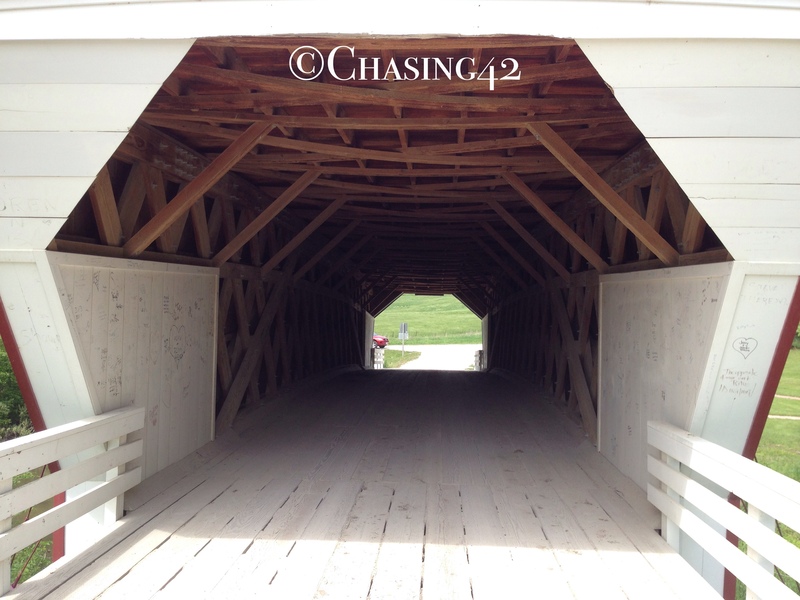 One of the four historic bridges of Madison County. Yes, THOSE “Bridges of Madison County”. The three of us eagerly anticipated an aid station around mile 40, so we gave ourselves permission to walk a bit. Unfortunately, the aid station was a few miles further down the road, and we were running low on water. We were forced to walk quite a bit more than we would have liked, and the aid station at mile 42 was a welcome relief, even after getting a bit lost and adding some distance! Some rehydration, a hit of ibuprofen, some more sunscreen, and I was back on my way. I managed to convince myself I was lost a ways down the road, and doubled back, but was on the right track and met up with the others I was running with along the way. After a few more miles, we caught up with the 4th member of our finishing pack. This proved to be a pivotal moment for all of us. 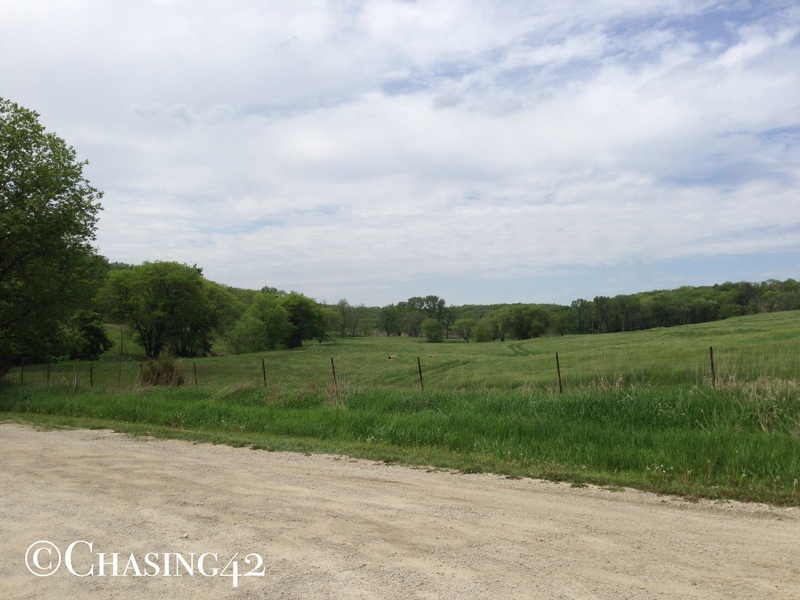 Walking backwards…wait, that was supposed to be “backROADS”…right! We met him at the base of a hill (I’m pretty sure we were always either going up or coming down a hill), and invited him to join us. At this point, we were taking the day one mile at a time, and trading point-to-point directions to keep ourselves moving. All of our legs were feeling it at this point, and the heat was no friend. The 4th member of our crew was in the same boat and happy to join. As it happened, his brother and other family members were following him along the course and providing a portable aid station of sorts. He graciously offered his resources to us, and this roaming aid station made all the difference in the world! We were able to soak bandanas and hats in ice water, sip on cold water and diet Mt. Dew, and break up the run even more along the way. His brother and family proved to be the best aid station out there for us, and we were all eternally grateful for this mobile hospitality. 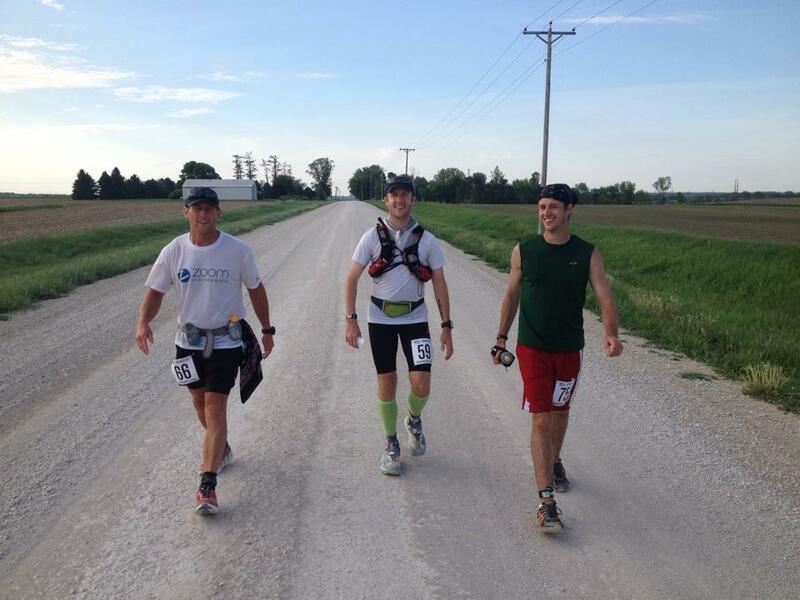 We continued to click off the miles, and finally arrived at the last aid station at mile 53. 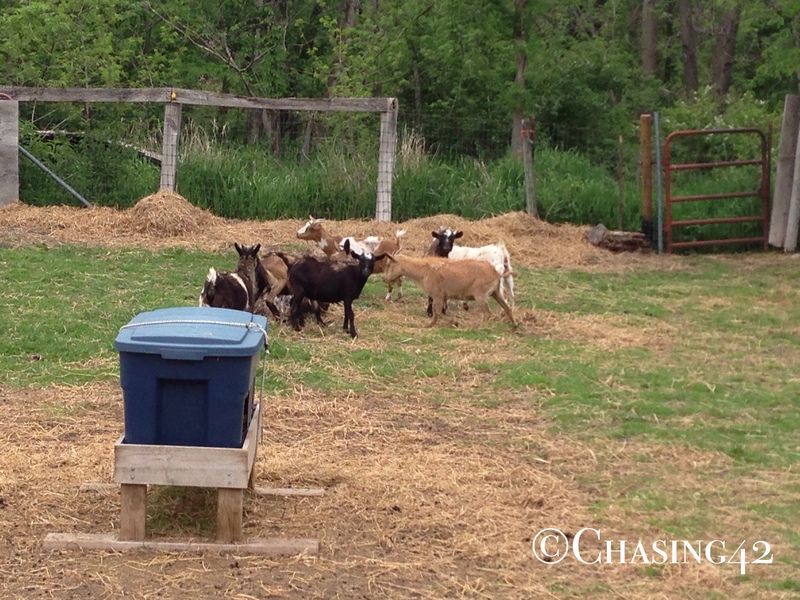 This particular station was run by a member of the GOATz running club out of Omaha, and was a sight for sore eyes. She had originally signed up to run the race, but pulled out due to injury and decided to come up and volunteer instead. She purchased some of her own food, coke, and supplies, and put out quite a spread for us. This was a wonderful final boost for us as we pushed on for the last 9 miles. The dust being kicked up by the occasional car or truck, combined with the heat, and my sore left IT band, made for a somewhat painful push to the end, but I was determined to see this race through, and the four of us formed a fantastic support system and stayed motivated as a result. Heading towards the finish line! As we entered the final mile and knew the finish line was in sight, our spirits were lifted the little bit extra that it takes to finish an endurance event. We made the final turn, and could see the finish line ahead of us, so we all decided we would eek out what remaining energy we had and make sure we were running across that line. We should have known better, as we had been fooled by the long, deceptive country roads all day, but we probably began running a bit sooner than we thought. However, the excitement at finishing was enough to keep the adrenaline pumping, and the four of us crossed the finish line with smiles on our faces. There was no question that I had left everything out on the course, and I was quite pleased to have crossed the line in 13 hours and 39 minutes. The unexpected challenges on the course were offset by the supportive camaraderie and great conversations that helped all of us pass the time. The RD and race staff did a great job pulling together the race in the end, and I’m excited to see how this race unfolds in the future as the ultra-running community grows in Iowa! The more races I run, the more I realize why I enjoy pushing myself so much. The memories, experiences, images, and stories I walk away with after each of these events solidifies their value in my mind. I feel alive in such a unique way during these events, and those life experiences become a part of me. My legs may still be a bit sore, but I exercised the 100K demon, crossed the distance off my list, and I’m already scouring race websites for more challenges to come!